Shelor, a Virginia Country Music Hall of Famer, is also a four-time award winner of the International Bluegrass Music Association (IBMA) Banjo Performer of the Year and was nominated again this year in that category. He joined Lonesome River Band in 1990 and has led the band since 2000. He has his own signature Sammy Shelor banjo fingerpicks and a signature model banjo produced by Huber Banjos. Banjo pickers all over the world have studied Shelor's tab books and instructional DVDs. Next week, he will launch SammyShelor.com with more information on these products. 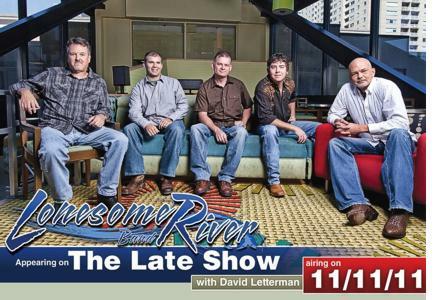 Lonesome River Band, who are celebrating their 30th anniversary, will soon be announcing numerous 2012 album releases, special performances and more exciting news. In the meantime, please visit LonesomeRiverBand.com to learn more about members, Sammy Shelor, Brandon Rickman, Mike Hartgrove, Barry Reed, and Randy Jones. The Steve Martin Prize is chosen by a who's who list of talents including Steve Martin, Earl Scruggs, Pete Wernick, Tony Trishchka, Bela Fleck and more. Shelor was overjoyed when learning of the news today and said, "It is truly an honor to be considered for an award like this and especially an honor to be recognized by people that I highly respect as contributors to bluegrass music." Sammy Shelor, who is a four-time International Bluegrass Music Association (IBMA) Banjo Performer of the Year award winner, was nominated again this year in that category. Lonesome River Band also received IBMA nominations for Instrumental Recorded Performance of the Year for their song "Pretty Little Girl" from their current album, Still Learning and for Album of the Year for their participation on "The All-Star Jam -- Live at Graves Mountain" album. LRB members were also part of two other IBMA nominations for the live album including: Sammy Shelor, Brandon Rickman and Mike Hartgrove for Instrumental Recorded Event of the Year ("Groundspeed"); and Sammy Shelor and Mike Hartgrove as part of the Recorded Event of the Year nomination ("Graves Mountain Memories"). Winners will be announced at the IBMA Awards Show September 29, 2011 at the Ryman Auditorium in Nashville, TN. Sammy Shelor joined Lonesome River Band in 1990 and has led the band since 2000. He has his own signature Sammy Shelor banjo fingerpicks and a signature model banjo produced by Huber Banjos. Banjo pickers all over the world have studied Sammy's tab books and instructional DVD from AcuTab. This month marks the 30th Anniversary of The Lonesome River Band who are currently on tour. Band members include: Sammy Shelor, Brandon Rickman, Mike Hartgrove, Barry Reid, and Randy Jones.